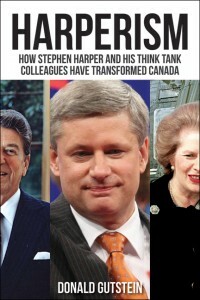 But the usefulness of the MLI report for the Harper Tories could be limited. Many of Newark’s claims were quickly shot down by leading criminologists. See here and here for some important critiques. The study makes much of the notion of unreported crime. If there is such a thing, then Statistics Canada’s information would be next to useless, since StatsCan data is collected from police reports. This reality-redefining campaign was kicked off by Treasury Board President Stockwell Day in the autumn of 2010 and seconded by current Public Safety Minister Vic Toews, who said recently: “It’s not that crime rates are falling. The reporting of crime is in fact falling.” We need to build more prisons in part because of this rise in unreported crime, is the Tory assertion. The Macdonald Laurier Institute is headed by Brian Lee Crowley, who claims his think tank is “non-partisan,” but perhaps coincidentally, only conservative ideas are disseminated. And even more coincidentally, these ideas are of great value to the Harper government. The institute has proposed, for instance, that pensions don’t need to be boosted, that terrorists in Canadian prisons need to be put in isolation so they can’t radicalize entire prison populations, that user fees and private health care are eventually inevitable for medicare, and that Canada needs to deepen its economic integration with the U.S. When Crowley was starting up his organization, federal Finance Minister Jim Flaherty hosted a private dinner at Toronto’s Albany Club to raise support for Crowley’s think tank. Flaherty wrote a letter inviting corporate executives to the event. In it, he said he was “giving it my personal backing… and I hope that you will consider doing the same… My office will follow up with you.” Was the finance minister using his office to raise funds for the new think tank? They were certainly already well acquainted. In 2006, Flaherty appointed Crowley the Clifford Clark Visiting Economist in Flaherty’s finance department, where Crowley gave policy advice — on what we can only imagine — to the new Harper government. Four months later, while still working in the finance department, Crowley incorporated the think tank. Harper’s new chief of staff Nigel Wright was then a trustee of Peter Munk’s Aurea Foundation, which gave Crowley $100,000 to help get his think tank up and running. ← Kevin Falcon — The Fraser Institute’s Candidate?